Each amino acid residue is shown as a dot in a graph of φ vs. ψ, more commonly known as a Ramachandran plot or Ramachandran map. Residues are shown as blue dots, or when selected, as red dots. 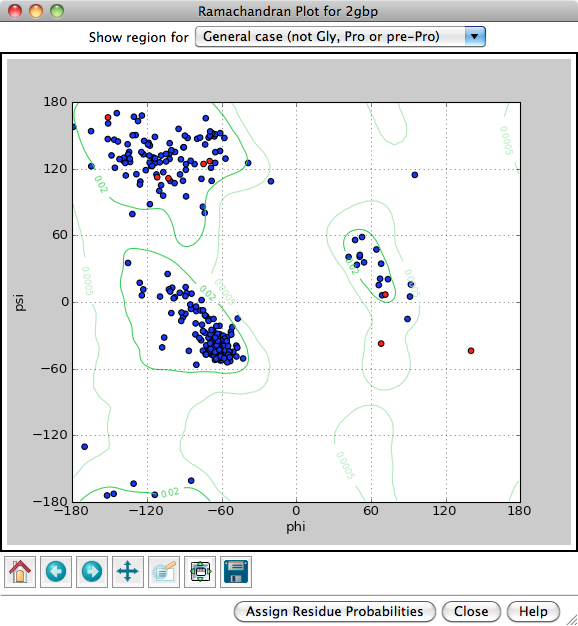 Conversely, clicking a single dot on the plot will select the corresponding residue in the structure. When the plot has mouse focus, the X and Y coordinates (in this case, φ and ψ values) of the cursor location on the graph are reported on the lower right. Below the plot are standard navigation icons provided by matplotlib. Assign Residue Probabilities assigns an attribute named ramaProb to the amino acid residues, with values taken from the appropriate dataset for each residue (Proline for prolines, etc. ), and opens the Render/Select by Attribute tool. Close removes the Ramachandran plot. Help opens this manual page in a browser window. Whether or not a Ramachandran plot is shown, phi (φ) and psi (ψ) are automatically assigned as residue attributes, and as such can be viewed/changed in the Selection Inspector or changed with setattr.